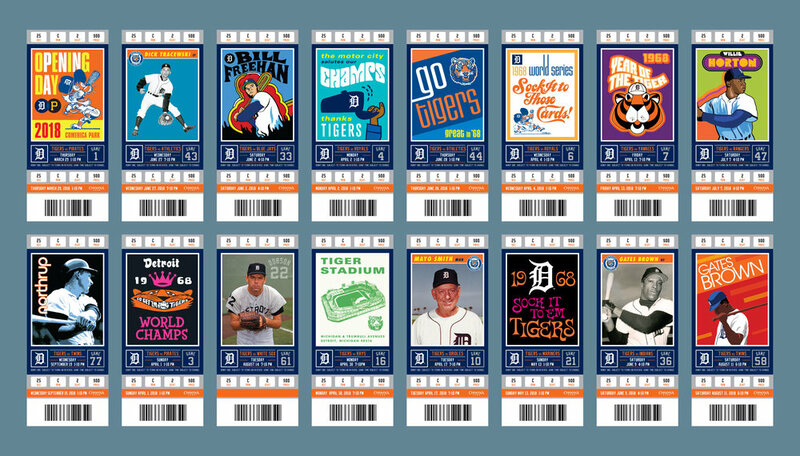 The Detroit Tigers 2018 season ticket package celebrates the beloved World Championship team of 1968, a golden anniversary worthy of commemoration every single home game. The 1968 World Series champions are remembered as a diverse and special team who helped unite the city of Detroit at a time of societal change and often violent civil unrest. The Tigers won the American League pennant and went on to capture the franchise's first Fall Classic since 1945, defeating the St. Louis Cardinals in a seven-game series. Tiger favorites such as Al Kaline, Willie Horton, Mickey Lolich, Denny McLain, Gates Brown, and others are celebrated here with a combination of original illustration, photography, and era-inspired typography. Seat and game information is delivered via a bespoke series of letterforms that duplicate the club's uniform numbers and player name lettering. Special thanks to Ron Wade, the club's Director of Marketing, for his vision in making this project happen.